Ms. April appeared in the eighth issue of Global Frequency, published in 2003. This entry has S P O I L E R S for it. The Miranda Zero character profile (wot explains the Global Frequency). The Winston Croft character profile (wot explains the first half of her main appearance). The John Stark character profile (covering her second appearance). Base of Operations: Los Angeles area. Eyes: Unrevealed Hair: Very red. Ms. April is a professional bodyguard. She also has an unclear criminal past, and possibly a military past, which involved killing quite a few people. She’s unusually tall and fit, and good with vehicles. 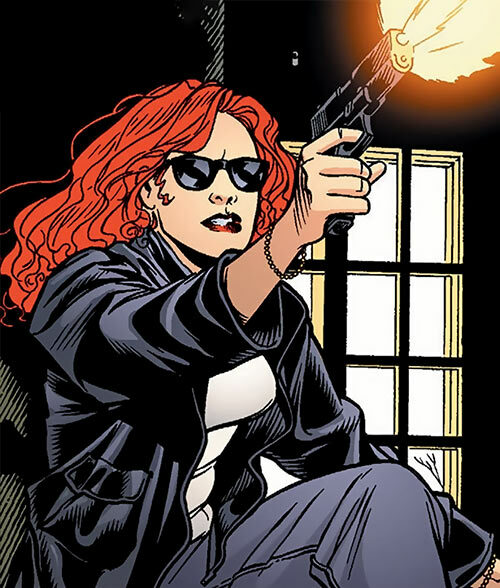 She demonstrated exceptional accuracy with handguns, and seems to excel with deadly violence in general. She’s packing a pair of M1911-type .45 pistols. We can probably assume match-grade custom pieces from a prestigious US speciality armourer such as Kimber, Dan Wesson, Wilson Combat, Ed Brown, etc.. She wasn’t seen dual-wielding during the story. April also wears high-end shooter shades, and carries her GF smartphone. During the “Harpoon” story, she wields what seems to be a H&K MP5A3. This is a workhorse high-end submachinegun, but she and John Stark using these may also have been mission-specific. The op was taking place within a civilian office block, and using the likes of 5.56mm FMJ would have meant overpenetration risks. Ms. April briefly operated an experimental “personal flight vehicle” called the Solosoar. It is developed by an L.A. company. A Global Frequency agent, Mark Tran, seems to be this firm’s CTO or CEO. The Solosoar likely was inspired by the real-world Martin Jetpack . The Solosoar is a sort of huge backpack, going from the knees to above the head. It has three wheeled “legs” to stand on once landed, and the two front ones have foot rests for the operator. Two thin arms extend under the operator’s arm, each bearing a joystick. The Solosoar was often called a “jetpack” as a shorthand. But it actually uses a pair of large ducted fans – a bit like some drones with shrouded rotors. This profile involves Britney Spears (no, really). So let’s go with one of the good ones, and appropriate to the Alice April character. Piece of me was released about 10 years after this story but heh, who’s counting. “Not I”, said the cat. In 2003, Global Frequency director Miranda Zero was kidnapped in Los Angeles by a pair of Neo-Nazis. Within ten minutes of Zero’s trackers going offline, an emergency procedure was launched. All LA assets were scrambled, support swarms rushed online and the LAPD received orders to collaborate. 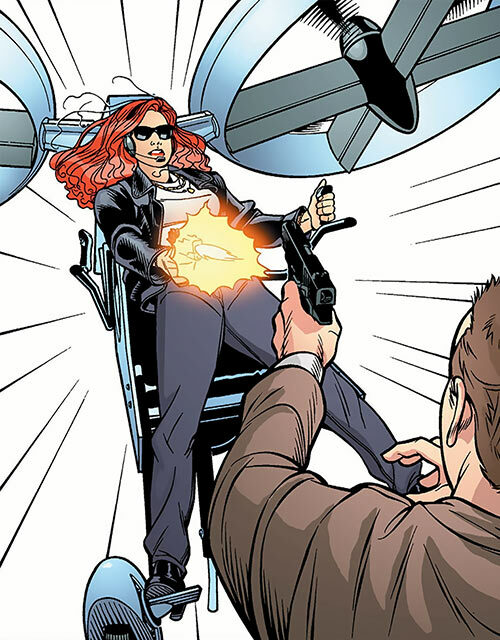 As the closest Frequency shooty type, bodyguard Alice April rushed in to join as the op’s muscle. She assisted retired master detective Winston Croft, and filmed surveillance footage for Frequency coordinatrix Aleph to use. Within an hour, Frequency experts had a good idea of where Zero was being held. April was issued a Solosoar prototype to fly there, and was still approaching when the exact address was found. Alice headshot the first kidnapper while she was still in the air. She dismounted, rushed in, then had high-resolution thermal imaging from a nearby surveillance drone streamed to her Frequency phone. This allowed her to shoot the second kidnapper dead through an interior door, since making entry would have been a terrible idea. This saved Ms. Zero’s life by seconds. Alice April was also part of Ms. Zero’s tactical team during the “Harpoon” story. During this op she spent some time with senior Frequency operative John Stark, and they seemed intent on fraternising. Ms. April is stated several times to “have gone straight”, and to have a particularly violent criminal past (as a hitwoman ? As a kidnapper ?). This reform seems to have taken place but a few years ago, and may have been facilitated by the Frequency. Alice instantly recognised Winston Croft, and vice-versa. She seemed uncharacteristically sheepish around him. 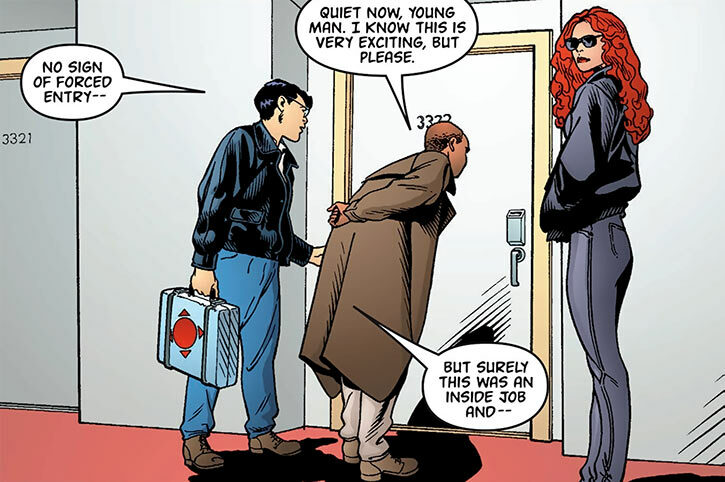 Perhaps the old detective arrested her a few times when she was but a kid ? When summoned by the Frequency, April referred to her principal as “Britney” and alluded to show-business. This presumably means that April was on Britney Spears’ large security detail, as the singer was back then at the height of her fame. Ms. April and Aleph made a reference to an incident involving a grenade and a sniper. This and several of April’s skills (seeming familiar with helicopters, precision shooting from the air, knowing how to use UAV thermal imaging…) seem much closer to commando experience and training. Have been an underage gunsel. Then doing a tour with a shock infantry unit (perhaps as a deal with a judge). Then being forced back into crime. Then having the Frequency help her go straight. Another scenario would be that she never served, but was involved with a mob staffed by former specops troopers. A simple scenario would have her working South of the border (perhaps Alice’s mum is Mexican) with a Los Zetas -type syndicate. But in the technothriller world of Global Frequency, a similar mob could easily exist in the US. Alice’s height is difficult to pin down, but she seems taller than most blokes by a good half-head. Our estimate at 6’2″ is an average, as often (and factors in what seemed to be 1″ heels on her leather boots). Her silhouette gives the impression that she frequently works out. She also sports the sort of mane of wavy orange-red hair that Irish tour operators are so fond of for their pretty lassies glossy photos to sell Éirinn vacations. She’s fond of sportsy black leather jackets and grey jeans. In California, she was permanently wearing her shades, even indoors. April seems to be a brash, loud, vocal type and a woman of action. She acted friendly and outgoing with Stark and Aleph, but was figuratively baring her teeth when interacting with LAPD patrol officers. She presumably hates cops. Howbeit, Mr. Croft seemed to make her uncharacteristically self-conscious. Perhaps they share a past. Or perhaps Croft’s extraordinary intelligence reminds April that she’s no brainiac. She is a resourceful and well-trained professional with a complex job, but she’s no sophisticated thinker. As part of her taste for big loud stuff that goes fast, April drives a bright red muscle car with, of course, an “ALICE” vanity plate. She also loved flying the Solosoar, not caring one whit that she wasn’t trained for this and was taking considerable risks just being in the air. Ms. April is proud of having gone straight, and of being a GF operative. When she’s on the Frequency, she’ll have the largest GF logo she can get – on the back of her jacket, or on her T-shirt. Expertise (Personal protection), Familiarity (Military equipment and protocols, and presumably one type of mob subculture). High-end .45 (x2) [BODY 03, Projectile weapon: 04, Ammo: 08]. 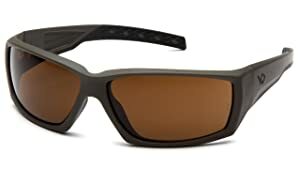 Ruggedised high-end shooting sunglasses [BODY 02, Shade: 02]. 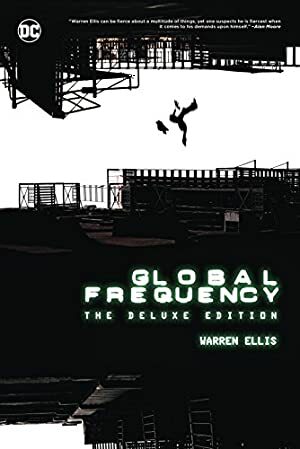 Source of Character: Global Frequency Vol. 1 #8. Writeup completed on the 25th of November, 2018.